This book examines the doctrine of giving no concessions to terrorists, and uses empirical research to establish whether there is any link between negotiating with such groups and the spread of violence. The logic of the no-concessions doctrine is based on the argument that other terrorist groups multiply when they realize that terrorism succeeds in achieving political goals. Proponents of the no-concessions doctrine have argued that there is a pattern in terrorist contagion which results from giving in to their demands. Statistical evidence for terrorist contagion is not convincing enough, however, as depicting an increase in terrorist incidences as a consequence of concessions could merely imply a flawed causality. Without an explanation for such correlations we are left wondering whether other reasons could be decisive in the increase in terrorist actions. 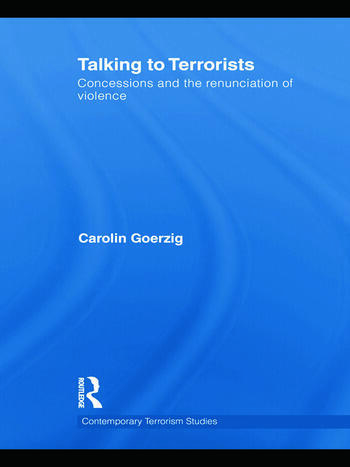 Based on field research in four countries and interviews with current and former members of several different terrorist groups, this book establishes a qualitative relationship between concessions to terrorists on the one hand and (non-)contagion of other terrorist groups on the other. The deterrence effect, intended by the imperative never to concede, is seriously challenged. In fact, it can be precisely through concessions that groups mentalities and actions are called into question. The book will be of great interest to students of terrorism and political violence, war and conflict studies, security studies and IR/politics. Carolin Goerzig is a Post-Doctoral Fellow at the EU Institute for Security Studies in Paris and has a PhD in Political Science from Ludwig-Maximilians-University of Munich.